Undergraduate students sometimes have trouble leveraging historical context to the end of persuasion. Reasons for this include that they may not see contextualizing (including the use of historical context) as a discrete and substantial task worthy of the same creative intellectual effort given the construction of arguments. 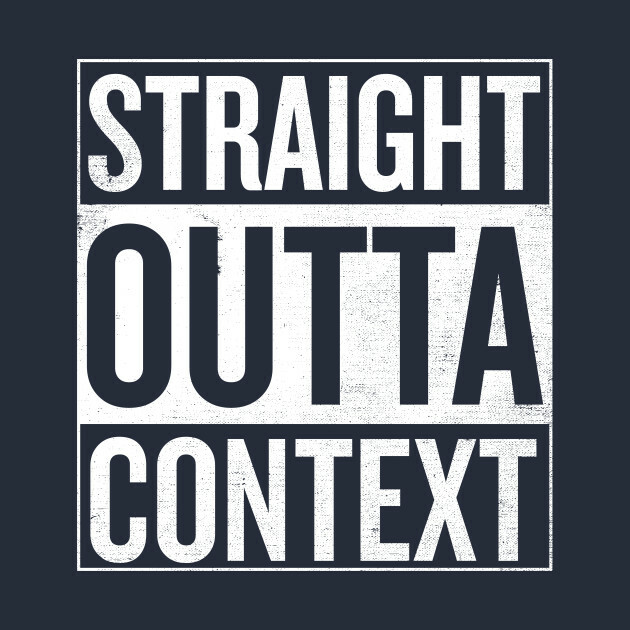 That contextualizing is sometimes taught as just one of several tasks to accomplish in an introduction that precedes the real rhetorical work of argumentation can exacerbate the problem. This assignment attempts to remedy the subordinate status given contextualization by providing students an opportunity to contextualize that is seemingly distinct from argument construction, both in proximity and medium. Context in this case does not precede the assignment; it is the assignment. This lesson plan also acknowledges that student preconceptions of contextualization are formed when learning and composing relative to traditional modes of writing. Shifting context to a medium not the same as that in which the argument is rendered makes unfamiliar the task of contextualizing, allowing students to approach the work of contextualizing in ways less encumbered by preconceptions formed while writing in traditional modes. Another obstacle to meaningful contextualization is the misconception that history is positivistic and/or objective–that students are telling the history or providing the context, as opposed to selecting or constructing a particular persuasive narrative among nearly endless possibilities for the purpose of plowing fertile discursive ground. Responding to each of these contextual concerns, this assignment will give students the opportunity both to create in another medium multiple disparate contextual narratives of a single historical moment, topic, or period and to then analyze the relationship between context and argument. You will want to set aside approximately three hours of class time to maximize the benefit to students. You will need a computer with iMovie or similar video editing software for each student, internet access, and a projector for a skills workshop. Basic video editing abilities will be provided in the skills workshop. The skills workshop video includes closed captioning (CC), and instructors should encourage students to provide CC for the videos they create in the course of the assignment. Note that this is most easily accomplished by uploading class videos to YouTube, as that platform will automatically generate CC for most videos. The CC generated is imperfect, though, and students will want to edit it. The assignment could also be adapted for sound, and instructors could have students produce podcasts instead of videos. In this case, the free audio recording and mixing software, Audacity, would be used in place of iMovie. Finally, if a group did not have access to Apple products or did not prefer them, most video editing software will suffice for the purposes of the assignment. In this lesson plan students will compose and leverage historical contexts through video creation with the hope that preconceptions concerning the secondary and positivistic status of historical context in writing will not travel across media. Students will receive instruction on the constructedness of historical narratives and their relationship to argumentation before having the opportunity to create two contextualizing videos for oppositional arguments. They will conclude with an analytical exercise using the videos created. Have read provided Hayden White text and come ready to discuss and apply the concepts encountered. This assignment proceeds in four sections–(1) classroom instruction, (2) video editing instruction, (3) video creation, and (4) responding in writing. (1.) For the classroom instruction portion, the instructor will review with the class the narrative qualities of histories as well as Hayden White’s terminology for analyzing such. Find below resources that will help instructors and students gain the familiarity they will need with White’s concepts and terms. For the truly invested, his book Metahistory (1973) includes the most comprehensive descriptions of his terms and concepts; however, for most classes a close reading of his article “Historical Text as Literary Artifact” (1978) may be more appropriate. It is relatively short and easily found through most library databases. Instructors may also want to use this terminology review sheet to help guide the students’ reading. The class will then screen two videos, each providing a different narrative of a single historical subject or moment. While many videos showing disparate histories could be productive, I’ve provided links to two short video histories (Video 1, Video 2) that set up very different arguments about Henry Ford. After viewing the videos, students are asked to apply White’s terminology and discuss implications for context and argumentation. Students should identify particular historical moments and the ideologies signaled in their representations. Students will then identify the types of arguments that each video conditions the audience to receive. It will be helpful to use White’s terminology here and to encourage students to do the same. (2). To gain the skills necessary for creating their own video contexts, students will watch the “Editing Videos in iMovie” instructional video together as a class. You may ask the students to watch remotely prior to class if you wish to save time, or you may have them watch on their own and then again in class to reinforce the instruction. Also, take just a few moments to show students how to find and use KeepVid or similar audio and video capture software. This software will be helpful to students as they gather material for their videos. Instructors can simply direct students here and have them paste the URL of any YouTube or Vimeo video into the converter. (3.) With their newly acquired skills, students will then create two short (60 seconds or less) video contexts. Instruct students that for the first video, they will compose a historical context setting the stage for the argument they brought with them to class. They will first use KeepVid or similar software to gather media for their video before moving to video creation. Once the first video is complete, students will write down the inversion of the argument they originally came with, and they will repeat the media gathering and video creation process (given above) to contextualize this new argument, leaving each student with two contextualizing videos. 1. In what ways did the particular context prepare and position you to be more amenable to the posited argument? 2. Which parts of the context made you less likely to accept the posited argument? 3. What addition to this context might have better positioned you to accept your classmate’s argument? 4. What other arguments can you imagine this context could productively precede? Next, switch the contexts, matching them to the “wrong” argument. Write a paragraph for each, this time answering only questions 1 and 2 above. The video below includes instruction on basic editing functions in iMovie. Have students watch at home, in class, or both. After viewing the video and experimenting briefly with iMovie’s interface, students should be equipped to begin video creation. Instructors may take one of several avenues for assessing the work done in this assignment, but they should avoid grading the technical qualities of the videos as many students will be coming to video creation for the first time, and levels of experience will vary widely. Instructors may choose to give the videos themselves a completion grade, while dedicating most of their attention to the written responses. Another possibility would be to not assign a grade to this project at all, but instead to look for and assess how well the skills developed here are displayed in the next major writing assignment. Whether instructors choose to evaluate the assignment in isolation or as one step in a larger project, it lends itself well to portfolio or learning record assessment. Digital portfolios are recommended, allowing students to include not only their written responses but all materials created and analyzed, including their own video contexts and those of the classmate with whom they partnered. The Goal of evaluation should be to gauge how well students incorporated understandings of historical context as multiple, subjective, targeted, and substantive. If instructors choose a traditional assessment strategy for this assignment, they may want to evaluate student video content on how well it signals an understanding of the strategic nature of context composition. Instructors may choose to evaluate written responses for application of terminology and concepts learned in class, and they may also wish to grade a student’s ability to respond critically to their classmates’ video contexts.